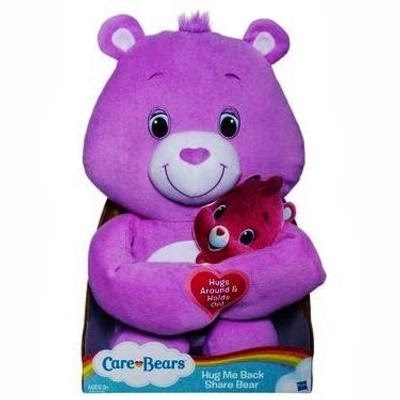 Notes: Give and get great big Care Bear hugs with this adorable plush Share Bear toy! 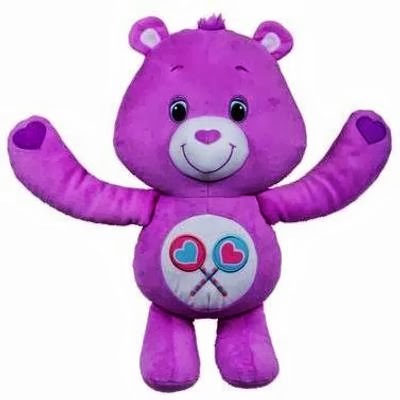 Your soft, plushy Share Bear friend has lots of love to share, and when you put her arms around you, she gives you a loving squeeze. Have a plushy, cuddly time with your Hug Me Back Share Bear! Soft, plush Share Bear toy! Put her arms around you to get a hug! Touch her paws together and she holds on tight. Credit: Care Bears products are produced by Hasbro under license from Those Characters From Cleveland, Inc. Hasbro and all related terms are trademarks of Hasbro.